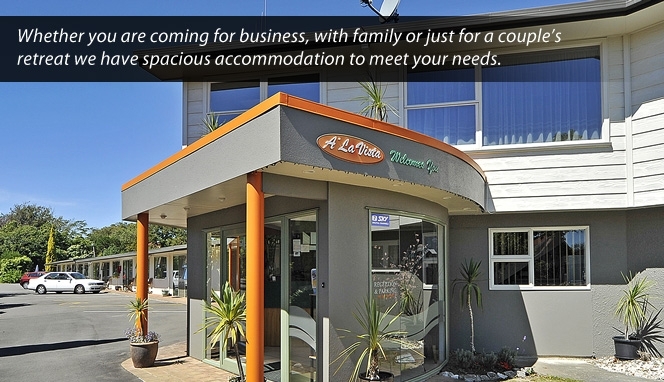 Whether you are coming for business, with family or just for a couple's retreat we have spacious accommodation in Palmerston North to meet your needs. We are a 5 minute walk into the city centre and a large selection of shops, Plaza shopping mall, restaurants, lively cafés, theatres, art gallery, the museum and the convention centre. Very nice spacious ground floor units situated at the rear of the property well away from the traffic. Super king bed, big double spa baths, kitchen facilities which include a microwave, 2 elements, electric frypan, pots etc. Table and chairs, 32" flatscreen TV, ceiling fan. A mixture of studio units available to suit your needs. All with kitchen facilities which include a microwave, 2 elements, electric frypan, pots etc. Tub chair or 2 seater couch, table and chairs, 32" flatscreen TV. A mixture of family units to suit your needs. Most with a queen bed plus 1 single in bedroom, 1 queen bed in lounge. Double spa bath, kitchen facilities which include a microwave, 2 elements, electric frypan, pots etc. 2 or 3 seater couch bed settee in lounge plus tub chairs in some. Table and chairs, 32" flatscreen TV in lounge, small wall TV in bedroom. Unit has 1 double bed in one bedroom, 1 queen bed plus 2 singles in the other bedroom. Kitchen facilities include microwave, 2 elements, electric frypan, pots etc, 1 fridge/freezer, table and chairs, lounge suite, 32" flatscreen TV in lounge, 1 bedroom with small wall TV. Bathroom has shower only. Extra person $20 Corporate rates available. Peak rates may apply. Group/team bookings welcome. Price on application. 17 ground floor units with parking outside your unit. Large outdoor swimming pool and BBQ area along with swings for the children. Units totally refurbished with wireless internet available throughout.